Around 10 this morning I took the last picture of The Adventurer as she turned the corner and drove out of sight on the heavily laden Dax heading for the fairest Cape of them all. I swung my camera over my shoulder, bent down to hug The Princess and stepped into a sea of mixed emotions and feelings. There she goes. Again. On an adventure. Alone. A piece of my heart slipped into her baggage. Heaven knows where it found space. But there she goes. Again. And I turn back. Alone. It is that time of year where the darkness starts rolling in earlier and as it does so, it steals the last bit of heat from the weakened sunrays and brings with it its own chill. Tonight there isn’t only a definite nip in the air, but my house and my heart seem to have assimilated that same coldness that emptiness brings. The Adventurer will be setting out from Agulhas, the southern tip of Africa on Saturday, to become the first woman to circumnavigate the second largest continent in the world. 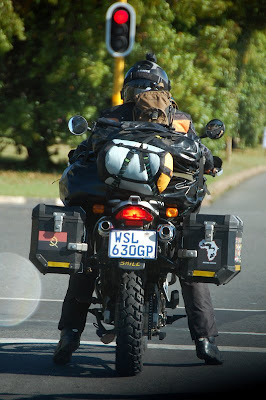 For more than 36,000 kilometers it will just be her and Dax, her trusted BMW Dakar motorbike. The Adventurer is a remarkable woman. Who believes in dreams. Who believes in following them. Who believes in making them come true. Tonight, my dearest friend, my dream for you is an awesome journey. A journey that will take you to the most wonderous places, introduce you to the most amazing people, serve you a taste of the delicacies of the diverse cultures, show you the incredible beauty of this fascinating continent, teach you as much about others as about yourself. My dream for you is to come back a wiser woman, a stronger woman, a more enriched woman. My dream for you is that every moment is as rewarding as you imagined it to be. But above all, my dream for you is that you remain safe. The Princess and I will miss you so very much! The music: My dream for you is a journey to a wonderful world. The photograph: The Adventurer and Dax. Packed and rearing to go on their incredible journey.